We created this guide in collaboration with Lindsey Horton, an expat with 7 years experience in Shanghai. We’re thrilled she agreed to share her passion and knowledge of Shanghai as our local city expert for this Where to Stay in Shanghai Guide! And if you’re planning a trip to China, be sure to check out our Where to Stay in Beijing Guide as well, which is also written by a local expert! When I moved to Shanghai in 2010, my plan had been to spend a year in China before moving on. I had no idea how much the city would draw me in or that I would end up writing about it so many years later. It’s a city pretty much divided into two by the Huangpu River. West of the river lies the Puxi area (xi = west in Mandarin) and east of the river is Pudong (dong = east). Within these two areas lie a wealth of districts from the uniquely Chinese to a more Western experience. The Bund (Waitan): The Bund is definitely the heart of the tourist quarter, and probably the best place to stay in Shanghai if it’s your first time in the city. Be sure to go up the Oriental Pearl Tower, or enjoy a cocktail on a rooftop bar at night to enjoy some incredible views over the city! Jing’an: If you want to stay somewhere central from where you can easily visit the neighborhood’s famous Buddhist temple and other nearby attractions, Jing’an is one of the best places to stay in Shanghai. Don’t leave without trying a Chinese message in one of the many massage parlours in this area! The French Concession: The French Concession is a great area to stay in Shanghai if you’re interested in nightlife, fancy cocktails and the best dumplings in town…or if you want to feel like you just stepped back in time thanks to the beautiful French-style architecture. Putuo: A bit far out as a place to stay, Putuo is still worth exploring if you want to save some money by basing yourself outside the city center. Similarly, if you like the peace and quiet of a quieter and greener neighborhood, then consider staying in Putuo. Pudong: Pudong is the best area to stay for Shanghai Disney Resort, and is also great for business travelers wanting to stay closer to the airport. Pudong is also a great area if you want to stay away from the hustle and bustle of the city center, without missing out on great shopping and dining opportunities. So….Where Should You Stay in Shanghai (A Summary)? The Bund is one of the most areas in Shanghai and is located on Zhongshan Road, with the closest metro station being East Nanjing Road where lines 2 and 10 meet. The Bund has some of the most interesting architecture in the city, which can enjoy simply by walking along it, and the views from the many rooftop bars at night are amazing. VUE bar at the Hyatt on the Bund (199 Huangpu Lu (Road), near Wuchang Lu) is one of the most famous. For those looking for a budget alternative, try the Captain’s Bar (Fuzhou Lu near Sichuan Zhong Lu) on the roof of the Captain Hostel. If you feel like hitting a club, M1nt on Fuzhou Lu near Shanxi Nan Lu is a good choice. Be warned, though: it is pricey and table service costs extra. Whether you stay by the Bund or are just visiting the area, it is worth walking through the Huangpu tunnel, which goes under the river to Lujiazui in Pudong , and taking a trip up the iconic Oriental Pearl TV Tower for spectacular views. Staying in or around the Bund provides a central location for getting around the city and visiting some of the best spots, as well as easy access to the Nanjing Road Shopping Street. It’s easy to understand why most visitors consider the Bund one of the best areas to stay in Shanghai! The Peninsula Shanghai – Named the best hotel in Shanghai in 2017 by Travel + Leisure, The Peninsula features exquisite retro-style interiors and the opulence you can expect from a 5-star hotel. The views from the rooftop bar are to die for, so make sure you enjoy a cocktail up top! Guests can also relax in the spa and the heated swimming pool, or dine in two Michelin-rated restaurants. The hotel is right across from the Bund and a 5-minute walk from East Nanjing Road Pedestrian Street (closest metro). Fairmont Peace Hotel On the Bund – A historical gem that has been recently renovated to offer a modern and comfortable experience, this is a 5-star hotel that guests don’t easily forget. The rooms are as luxurious as you can imagine and feature everything from an espresso machine to deep soaking tubs. The location on the Bund is ideal for touring Shanghai, and Nanjing Road Pedestrian Street is only a 5-minute walk away. Les Suites Orient, Bund Shanghai – Featuring a fusion of Art Deco and Oriental designs with a magnificent view of the Huangpu River, this hotel offers luxury suites with gorgeous views. Past guests loved the views of Shanghai’s Skyline as well as its convenient 24-hour gym. 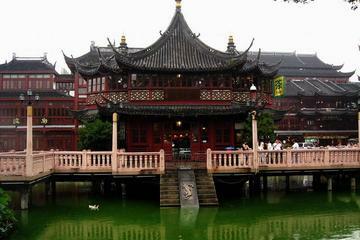 10-minute walk from Yu Garden and a 12-minute walk to Yuyuan Garden Station. Shanghai Grand Theatre and Shanghai Art Museum are an 8-minute cab ride away, making this a convenient base for art and cultural travelers! Metropolo Classiq, Shanghai, Bund Circle – Featuring comfortable rooms, a gym and impressive views of Shanghai, this 4-star has a striking design and decoration, with an upscale boutique fell. Past guests love its close location to The Bund, the afternoon tea and coffee, gorgeous interior design and its quietness. Shanghai East Jinling Road Ferry Station is a 5-minute walk, while The Bund is just 5 minutes away. Great option to be close to all of the cities’ attractions. Shanghai 8 Art Hotel – Featuring bright and colorful interiors and wall paintings, this a quirky boutique hotel that has a good quality-to-price ratio in a notoriously expensive neighborhood. The rooms are a little on the small side, but they provide guests with everything they may need, including an electric kettle. Situated directly across the Bund, the hotel is also near (10-minute walk) the ferry terminal to Lujiazui financial area, and is surrounded by restaurants and cafès. 13-minute walk to Yuyuan Garden metro station. Campanile Shanghai Bund Hotel – Another value-focused option in a notoriously expensive neighborhood, this property offers spacious rooms and a great location. Previous guests loved its central location within walking distance to many attractions, comfy rooms and the price-to-quality value. The hotel is located 5 minutes away from Yuyuan Garden Station and an 8 minutes’ walk to People’s Square, giving easy access to all of Shanghai’s attractions. The first place I ever lived in Shanghai, Jing’an is a favorite of mine. I still enjoy taking the metro to Jing’an temple and wandering up Shaanxi Bei Lu to grab wings at the Shed (a pub) near Kangding Lu. You’ll find a plethora of decent restaurants and places to relax in this area, making it a great bet when you’re wondering where to stay in Shanghai. Jing’an area does not just boast the famous Buddhist temple of the same name (entry: RMB10), but it is also very central to get to places like Nanjing Road, People’s Square and museums such as the amazing Shanghai Natural History Museum on Haiguan Lu near Datian Lu, or the famous Shanghai Museum on People’s Avenue near Huangpi Bei Lu. Leaving Shanghai without trying a Chinese massage would really be a shame, so be sure to treat yourself to a massage at one of the many cheap massage parlors in Jing’An, such as the Ganzhi Blindman Massage on Beijing Xi Lu. Alternatively you can just pop in and get a foot massage from one of the many places located around here. Be warned, though: massages in China are not for the faint-hearted and will leave you feeling like you went ten rounds with Thor! Overall, Jing’An is another top area to stay in Shanghai for those looking for a convenient and central base in the city! The Drama – With superb interior design worthy of Shakespeare’s most lauded plays, The Drama’s rooms encompass the beauty of a classical era with a modern touch. Past guests mention the big open spaces, and the pleasure of a cup of coffee or tea enjoyed from their balcony. The hotel is just 15 minutes away from Jing’an Temple, and within walking distance of shopping, making this property a great option for visitors. 20-minute walk from Jing’an Temple Metro station. The Puli Hotel And Spa – Modern décor, skyscraper views, and a great location are some stand-out features of this property. Past guests appreciate the indoor pool, spa, the floor to ceiling windows, and the well-equipped rooms as top features, as well as the on-site long bar and library. A 3-minute walk from the Airport Express Shuttle Service and Jing’an Temple, this hotel’s location is ideal one sightseeing in Shanghai. 5-minute walk from Jing’an Temple Metro Station. URBN Boutique Shanghai – This environmentally-friendly hotel prides itself on its contemporary Asian style, which seems like a perfect match for a cosmopolitan city such as Shanghai. The courtyard area for evening relaxation the complimentary happy hour drinks and snacks are some of the features that make this hotel special. This property is just 2 blocks from Nanjing shopping street, and a short taxi ride to Hengshan bar street. Just a 6-minute walk from Jing’an Temple Metro Station, it’s a convenient base for city lovers. World Union Service Apartment – Cosmo – These spacious apartments with modern décor are a good option for travelers interested in exploring Shanghai without giving up the privacy of home. Past guests loved the fully equipped and functional kitchen, the maid service, the big open spaces and the floor to ceiling windows. A taxi will get you to The Bund in 15 minutes, and it’s just a 5-minute walk from Jing’an Temple Metro Station. Good apartment option for exploring the city! CACHET Boutique Shanghai – Located in a classic building from the 1920’s, this 5-star boutique offers gorgeous furnishings, spacious and modern rooms, as well as fine beddings with goose-down duvets. Previous guests mention the nearby restaurants, the lounge area and the comfort of the hotel’s beds as well as the friendliness of the staff. This hotel is a 2-minute walk from West Nanjing Road metro station (line 2, 12 and 13) and a 5-minute drive from People’s Square, making it well located for exploring the city. Paramount Gallery Hotel – With a unique fusion of Art Deco and modern European designs, this boutique property will make you feel as if you just stepped in a different continent. Past guests liked the size of the room and bathroom as well as the views of Shanghai, as well as the premium location. The hotel is a 2-minute walk from Jing’an Temple Station (line 2 and 7) and a 1-minute walk to Jing’an Temple, making this property a good option for sightseeing. The French Concession is a beautiful area of Shanghai with a wealth of dining and nightlife options as well as some of the best shopping areas. Located in the heart of the city (Luwan and Xuhui Districts), this part of Shanghai was once French territory and has retained much of the architecture from that time. Add to that, it’s a foodie delight and finding just one or two places to recommend is a significant challenge! Try Fresh Maple (steak and seafood) on Fuxing Zhong Lu near Fengyang Lu, and then pop next door to Barroom for one of their incredible cocktails. For the joys of a dive bar, don’t miss I Love Shanghai on Taikang Lu near Sinan Lu. Relocated from the Jing’an location a few years ago, it is a great place to spend a relaxed night. To recover from your night out, you can’t go wrong at one of the two Al’s Diner locations (Xiangyang Nan Lu near Fuxing Lu or Xinle Lu near Donghu Lu). Their menu has a dedicated hangover section as well as a great choice of breakfast options. For more local food delights try Loushi Tangbao on Nanchang Lu near Xiangyang Lu for xiaolongbao – dumplings. A tiny place with long queues, it’s worth the wait. Alternatively, traditional Shanghainese rice dishes can be found at Xuezi Cai Fan on Yongjia Lu near Hengshan Lu. Once you have filled yourself up with food, wander along Fuxing Lu for hidden shopping gems. Twelve at Hengshan – The unique fusion of Oriental and Art Décor creates a lovely marriage of Eastern and Western culture in each of the rooms at this luxurious property. Past guests love the fully equipped gym, the swimming pool, business center, and spa facilities, as well as the complimentary fresh fruit and soft drinks at the minibar. From this property, the Shanghai Railway Station is a 10-minute taxi ride away, while a 3-minute walk will take you to the Hengshan Road metro station from where you can travel to any point in the city. Shanghai Donghu Hotel – Decorated in an old-Shanghai-style, this luxury 5-style hotel features a swimming pool, a fitness centre, and a sauna. Previous guests loved the location, the retro decoration, and the generous size of the rooms. Located in the busy Donghu Street area, the hotel is an 8-minute walk to the nearest metro station (Shaanxi Road Station), while the famous Jing’An Temple can be reached in a 16-minute walk. Quintet BnB – This bed and breakfast will surprise you with its clean and comfortable rooms in a traditional house…this is the kind of place that will transport you back to a different era of Shanghai’s rich history. The sun terrace, the views from the garden and the small-town warm atmosphere of the house’s owners are what most guests prefer about this B&B. This charming house is centrally located with the Changshu Road Station being only 4 minutes away on foot while the Jing’an Temple is just 8 minutes. Putuo is a far less well-known district of Shanghai, and therefore much cheaper! While there’s not so much to see and do within the area itself, it is easy to get to other areas while also saving some cash on accommodation. The one place not to miss if staying here is the M50 Art district, which can be reached either via line 13 Jiangning Lu station or Zhongtan Lu on lines 3 and 4. 50 Mogashan Road, which gives the district its name, is home to the famous Shanghai graffiti wall as well as a plethora of art galleries and studios. There are any number of cafes and places to relax in this area. The Warehouse Café on Huai An Lu near Suzhou Lu does cheap beer and has a lovely outdoor patio. There are also plenty of parks to relax in around here with Changfeng Park being the most famous of these. Have a go at boating on the lake here or just relax and enjoy the surroundings. You can also check out the Jade Buddha Temple on An Yuan Lu near Jiangning Lu and get a RMB5 bowl of noodles while soaking up the history and culture. If you want a quieter and more cost affordable experience, Putuo is a great area to stay in Shanghai! Modena by Fraser Putuo Shanghai – These fully furnished apartments with kitchen are a great example of how much style you can find in Shanghai! Past guests love the 24-hour gym, the games room and the barbecue facilities that make these apartments feel just like home. Located in the heart of Zhenru City’s business district in Putuo, these apartments are just a 2-minute walk away from Langao Subway Station, making them a good base for travelers. Renaissance Shanghai Putuo Hotel – Featuring 330 beautiful rooms as well as an indoor pool and spa facilities, this luxury hotel is a great base outside the centre, with convenient access to much of the city. Previous guests mentioned the comfortable beds, friendly staff and the all-knowing concierge service. A 10-minute cab ride (or a 30-minute walk) to Shanghai Railway Station, from where you can connect to any point in the city. 45 minutes to Pudong International Airport. Holiday Inn Express Shanghai Zhenping – A good value option combining price and quality. Past guests love the cleanliness of the hotel and the superb location in the Putuo area, with tons of coffee shops and bars nearby. This property is a 10-minute walk from Changshou Road Station, while the Zhenping Road Metro Station is 1 minute away on foot. Good option for those who want to focus on exploring Putuo and the rest of the city. 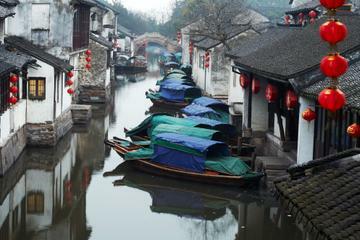 Most of the recommended areas to stay in Shanghai focus on Puxi. If you want a totally different experience, head across the river! Business travelers and those with young children might prefer Pudong for its convenience to the airport, quieter locations and the newly opened Shanghai Disney Resort. Boasting its own metro stop at the end of line 11, Shanghai Disney is a great place to take the family, combining Disney magic with something a distinctly Chinese twist. Pudong is far greener, more open and less crowded than Puxi. The nightlife is much less, making this ideal for those with families. The Lujiazui finance district, where the Oriental Peal, the Shanghai Tower and the Disney store are located, is an upmarket shopping paradise. The Super Brand Mall is one of the most famous malls in Shanghai, and you can’t leave Shanghai without taking a trip to the top of the tallest building in Shanghai, the Shanghai World Financial Center. Another recommendation is to check out the market at Shanghai Science and Technology Museum stop on line 2 of the metro. As well as bags and souvenirs, the tailors located here can create anything you want quickly and cheaply. This may not be the first thing a traveler looks for, but getting a new suit made or copies of a favorite pair of pants has never been simpler or more convenient! Maixinge Boutique Hotel Chuansha – This boutique hotel might not be the most luxurious choice in all of Shanghai, but its free shuttles to both Disney and the airport will make this your favorite choice for visiting the land of fairy tales. Past guests say they loved the small details of the staff, such as giving complimentary Mickey Mouse toys to kids which will definitely bring a big smile to their faces. This property is 10 minutes by taxi ride to both Disney and the airport, although the hotel offers free shuttles every hour to make your stay in Shanghai more pleasant and hassle free. Holiday Inn Shanghai Jinxiu – Modern and comfortable rooms are a staple of this hotel chain, and this property seems to live up to the reputation. Past guests love the indoor pool, 24-hour gym and the knowledge of the super friendly staff.This hotel is 10 minute taxi ride to the Shanghai Exhibition Center, making this a good option for business travellers. Shanghai’s historic Bund is 20 minutes away by taxi, and the hotel provides a shuttle to a few destinations. Four Seasons Hotel Pudong – Living up to the brand’s reputation for world-class luxury, this property will offer you stunning views of Shanghai’s skyline and rooms where you might struggle to leave! Past guests love the sauna, massage treatments, business center, indoor pool, infinity Jacuzzi and the fitness center. This property is just a 5-minute walk away from Shanghai World Financial Centre, IFC Mall and Oriental Pearl TV Tower, making it a good option for sightseeing or business. Ling Home – Dreaming of fairytales? The rooms of this bed and breakfast might transport you to a land of magic thanks to its close location to Shanghai Disney Resort. Past guests loved the family touch of the house as well as its unique location to one of Shanghai’s most visited attraction. The park is indeed just 25 minutes away on foot, making this a great budget option for visiting Disney. The airport is 10 minutes away by bullet train. Green Court Residence Jinqiao Diamond Shanghai – Away from the heart of the city, this hotel will charm you with its cleanliness and views of Shanghai from the room’s windows. Previous guests liked the recently renovated rooms and the helpfulness and friendliness of the staff. This hotel is a 10-minute taxi drive away from the nearest metro station, so is best suited to those planning to use taxis, or those with their own transportation. The Ritz-Carlton Shanghai – Offering great views of Shanghai and luxurious rooms in an Art Deco style, this luxury hotel looks like a great option in this area! Past guests love the 24-hour gym, indoor pool, dry sauna, exclusive spa and the 24-hour Club Lounge for selected Club rooms guests. This property is just a 5-minute walk away to all of the following attractions, making it a perfect option for sight-seeing: Oriental Pearl Tower, Jin Mao Tower, Shanghai World Financial Centre, Shanghai Centre and Shanghai Ocean Aquarium. So Where Should You Stay in Shanghai? Where to stay in Shanghai depends on what you are looking to get out of your trip. The Bund and Jing’An are the best areas to stay in Shanghai for first-time visitors, because they are both very convenient for sightseeing. However, expect to pay a premium in these areas. The French Concession is the best area to stay in Shanghai for nightlife. It’s well-located, vibrant, and a great area for foodies as well. Plus, the gorgeous architecture is sure to inspire. 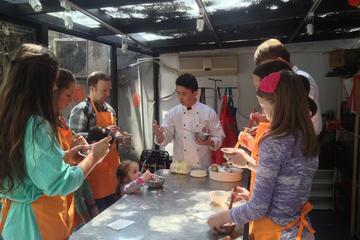 Pudong is easily the best choice if you have business to conduct or a family to entertain. Pudong is the best place to stay for Shanghai Disney, as well. Shanghai is easily one of the safest cities I have ever lived in, with convenient transport to get you wherever you want to go and friendly locals. Don’t expect the average person to speak English, but they are always willing to communicate through gesture and signs! It is a city that always has something going on, whether you are there for the culture, the sights or just to have a good time! 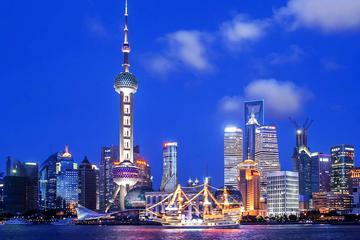 Before choosing where to stay in Shanghai, think about how you will be getting around the city. The first thing to learn is how well developed the metro system is. It services the vast metropolis quickly and conveniently. A safe bet for a newbie to the city is staying near line 2, which runs from Hongqiao Airport in the west of Shanghai to Pudong Airport in the east. An alternative is staying near line 10 which runs from Hongqiao and stops in the French Concession. The Shanghai Public Transport Card (Jiaotong Yikatong) can be purchased in any metro station service center and is easily reloaded at convenience stores and in metro stations. This card doesn’t just serve as a metro pass but can also be used on buses, ferries and even in taxis! Taxi drivers will almost certainly not speak English. Directions will require two streets in Mandarin. Unless you are going to a recognizable tourist destination (where the Chinese name will still be necessary), you should tell the driver the name of the street you want as well as the nearest cross street. So if you feel like enjoying a Liquid Laundry brunch, you will need to tell the driver “Huaihai Zhong Lu, Donghu Lu” rather than just saying “1028 Huaihai Zhong Lu”. In other words, give them an intersection. Taxi cards are a must. Hotels and businesses will carry cards with their address in Chinese characters. These can be given to the driver to take you places. Given the tonal nature of Mandarin, even if you know the road names, the driver may not understand your pronunciation. You can also download a taxi card app such as Taxi Card Shanghai. Note that Google Play cannot be accessed in China, so downloading the app prior to arrival is a must. Finally, bike-sharing is the newest and often the most fun way to get around the city, with Shanghai having well-developed bike lanes. A lot of the bike services only have Chinese language versions of their apps, but Mobike, the orange bicycles, works in English. They can be easily located throughout the city and are a convenient way of getting between places. You can pay your deposit on the app using Alipay and have it refunded at the end of your trip. Our hope with this Where to Stay in Shanghai Guide (and our Where to Stay in Beijing Guide, with more on the way) is to make it easy to find the best area to stay in Shanghai for your particular travel style, goals and budget. As we hired a local to write this guide and impart her expertise about Shanghai, we’re a bit limited in terms of hotel knowledge…because, of course, locals don’t live in hotels! So, what we’ve done is go through and choose some of the highest rated hotels in each area (and holiday apartments, too). We put in the research for you, and chose the places we personally would like to stay in Shanghai, and the places we felt we’d be comfortable recommending to a friend or family member, across different budget ranges. Really, we want to help you have a fantastic trip to Shanghai, be it a longer trip around China or Asia, or a short Shanghai city break. And, we want you to be able to do so without spending hours on the internet, reading reviews and cross-checking locations on a map. Hopefully we’ve succeeded…but please don’t blame us if we haven’t – at the end of the day, we expect you’ll check the most recent reviews and specific conditions in the city, using our listings as a starting point and framework, and choosing then selecting the best hotel and area to stay in Shanghai for your own trip!